Kai Johnson received her Bachelor of Science in Management from the Krannert School of Management at Purdue University. 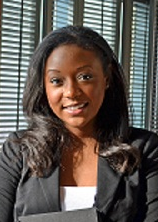 Shortly after her graduation in 2007, Kai began her Human Resources career as a Recruiter for Humana. After serving as a Recruiter for a year, Johnson fulfilled the role of a Human Resource Analyst. Currently, she functions as a Human Resources Consultant and an Inclusion & Diversity Consultant. As an HR Consultant, Kai provides specialized support for HR related programs, policies and initiatives in the following HR functions: benefits, compensation, employee relations, full life cycle recruiting, performance management and training. In her Inclusion & Diversity Consultant role, Johnson is responsible for marketing and branding Humana’s I&D programs and initiatives, in which she developed Humana’s 2012 Inclusion & Diversity Report to communicate their efforts and scope of I&D programs. In addition to her roles at Humana, Kai Johnson serves as a Board Member for Krannert School Alumni Association. We are pleased to have Kai Johnson as a member of our panel discussing “Creating a Culture of Diversity”.